HomeLet’s enjoy the fall foliage in South Korea! Let’s enjoy the fall foliage in South Korea! The weather is turning cold in South Korea – the beautiful fall foliage is now at its peak in most of the places there. According to the forecast by the Korea Meteorological Administration, the fall foliage will peak in Central Seoul by early November. In this post, let’s discuss some fall foliage sites in South Korea which I think are good – I consider them good not only because they’ve got beautiful fall foliage scenery but also because you can do some other interesting activities at the same time. If you like hiking, the mountain fall foliage sites are the must-go places for you. Hiking and picnicking are favourite activities of Koreans, and there are good hiking trails and national parks in the mountains in South Korea. Even for a person who does not like hiking very much like me, I like walking in the mountains in South Korea in autumn given the pleasant cool weather and the beautiful fall foliage scenery, and find such experience very refreshing. 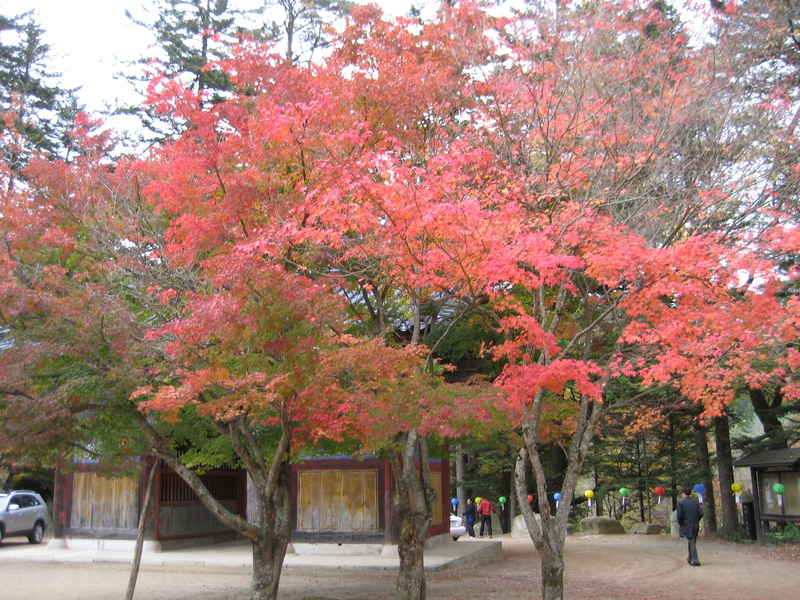 The popular mountain fall foliage sites are Seoraksan (설악산), Odaesan (오대산), Jirisan (지리산), Juwangsan (주왕산), and Naejangsan (내장산). You may notice the names of these sites all have the character “산” (san) which means “mountain” in Korean. You can find a good tourist guide (including transportation and attractions) on these sites on the Korea Tourism Organization website by clicking this link. If you find the above mountain sites a bit far away from the city centre of Seoul, you can go to Namsan (남산), which is an extremely hot tourist spot all year round (you surely know Namsan Park, Namsan cable car and N Seoul Tower) – get more information on the transportation and attractions of Namsan in this article. There is now an additional reason to visit the mountain fall foliage sites – until early November, there are some tourism-related activities to be held in some of these mountain fall foliage sites as well. For example, there are ecotourism and regional delicacies tasting activities to be held in Jirisan. Photo exhibitions and a marketplace of local goods like potatoes and apples will be held in Seoraksan National Park and Juwangsan National Park. For those who love history, fall foliage sites near cultural heritages are must-go places for you to enjoy the fall foliage and visit the historic heritages at the same time. For example, the path along the Deoksugung Palace’s stone wall is a favourite tourist spot. However, as mentioned in my post on some interesting Korean superstitions, if you believe in Korean superstitions, you should not walk down this path with your boy-friend/girl-friend or husband/wife. Otherwise, you will break up with them. Beside the Gyeongbokgung Palace, you can find the streets of Samcheong-dong – apart from the red fall foliage, you can also find the yellow ginko trees which make the scenery more colourful. The Fortress Wall of Bugaksan (북악산) is a popular trail course because you can also visit the old fortress and enjoy the view of Seoul over the fortress and fall foliage. However, as this area is under military control, when visiting the fortress wall, please make sure to bring proper identification (e.g., resident registration card, passport), and only take photos where it is officially permitted. You can find a good tourist guide (including transportation and attractions) on the above sites on the Korea Tourism Organization website by clicking this link. Universities are less-mentioned sites for enjoying the fall foliage. Undoubtedly, the scale of fall foliage in the universities is much smaller. However, I like watching fall foliage in universities with quiet academic environment and beautiful architecture since it gives me some academic, calm and romantic feelings. Sungkyunkwan University (at which I previously studied Korean and you can find over 600-year-old cultural heritages) and Ewha Womans University (with striking modern architecture) are good places to go. The fall foliage season has not yet ended, and if you travel to South Korea in early November, you may still be able to enjoy the fall foliage before they all disappear. Reminder: The date of publication of the next post will be announced on the “Latest News” page of this website when it’s available. Or you can follow my blog by clicking the “Follow” button on the sidebar to receive email notifications of new posts. Watch this space!